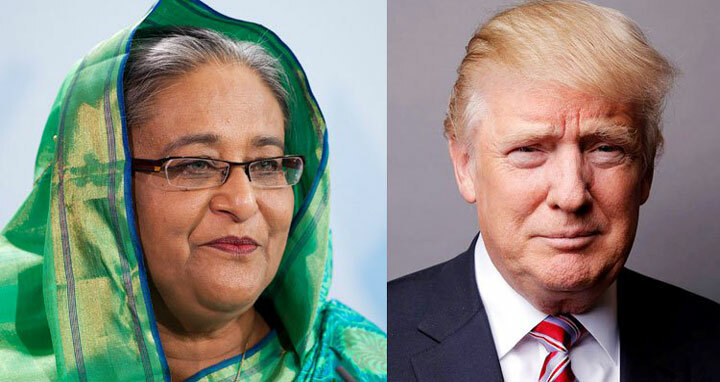 Dhaka, 4 May, Abnews: US President Donald Trump has assured Prime Minister Sheikh Hasina of continuing his country's pressure for the safe and voluntary return of the Rohingya people to their homeland as he sent a letter to the premier in this regard. "The United States will continue to pressure Myanmar to create necessary conditions for the safe and voluntary return of the Rohingya people to their homeland," Trump said in the letter to Prime Minister Sheikh Hasina. US Ambassador in Dhaka Marcia Stephens Bloom Bernicat handed over the letter to the prime minister when she paid a courtesy call on her at her official Ganabhaban residence here yesterday afternoon. In the letter, the US president said there is no question that those in Myanmar responsible for instigating this crisis must be held accountable. Trump highly appreciated the prime minister for her humanitarian leadership role in addressing the Rohingya crisis, the press secretary said. "The United States is deeply grateful to the government of Bangladesh for its generous humanitarian response to the Rohingya crisis," Trump said. The US president said hosting more than one million Rohingyas is a tremendous burden, but the world knows Bangladesh's actions have saved thousands of lives. "Your response is testament to the character and resiliency of the Bangladeshi people, forged in the hardships they endured in 1971," Trump told the premier in the letter. As the largest humanitarian assistance donor in the world, he said, the United States remains committed to supporting Bangladesh alongside "our international partners." "I hope Bangladesh continues to demonstrate the leadership that has resulted in recognition from around the world, particularly ahead of the challenging monsoon season," Trump said. The press secretary said the prime minister thanked the US president for sending the letter to her. He said the premier reiterated her call to the international community including the USA to continue mounting strong pressure on the Myanmar government to take back its nationals from Bangladesh. Sheikh Hasina said the government is developing an island named "Bhashanchar" to give temporary shelter to one lakh Rohingya people there. The prime minister said the local people are suffering and the environment is being affected due to the exodus of huge number of Rohingyas into Cox's Bazar. The US ambassador said the USAID has traditional programme for the assistance of the refugees across the globe and is working in Cox's Bazar under the UN system to mitigate the sufferings of the Rohingya people there. Bernicat informed the prime minister that USAID President Mark Green and CEO of the Carter Center and former ambassador Marry Ann Peters will visit Bangladesh soon to see the plight of the Rohingyas who fled to Bangladesh. The US envoy highly appreciated women development and empowerment in Bangladesh under the leadership of the prime minister and congratulated Sheikh Hasina as she was conferred on Global Women's Leadership Award-2018. The prime minister said Bangabandhu laid the foundation of women empowerment in Bangladesh as he took various initiatives for their development after the independence. PM's Military Secretary Major General Mia Mohammad Zainul Abedin and PMO Secretary Sajjadul Hassan were present on the occasion.